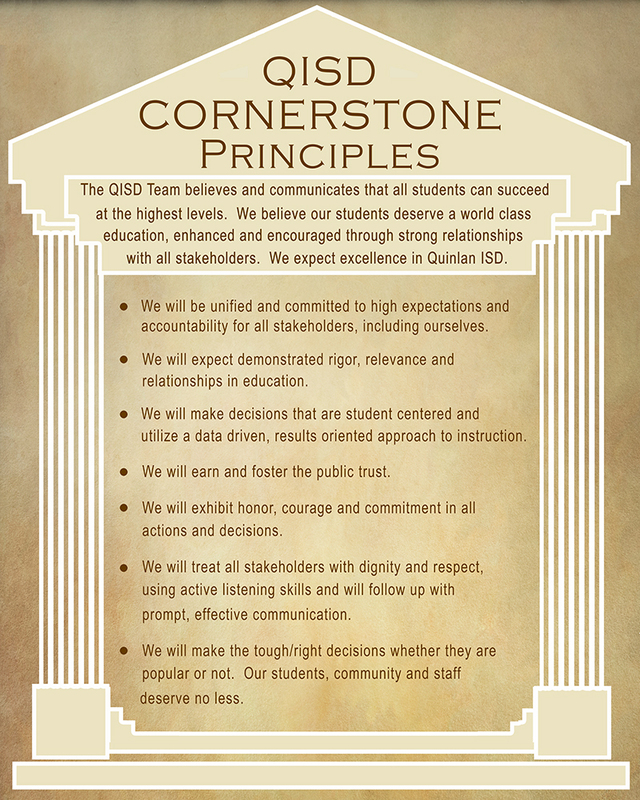 The goal of the Quinlan ISD Department of Family and Community Engagement is to work together in partnership with families and the community to help every child reach their full potential and to live happy and healthy lives. We are working to develop partnerships with community organizations, businesses, and institutions of higher education to provide opportunities that will allow for greater student success, stronger families, and healthier communities. • iMoms and All Pro Dads Breakfasts (It's a 30-45 minute monthly breakfast held before school where parents and their children meet with other families. During this time, they discuss a wide range of family topics, spend time together, create fun memories, and are equipped with resources to strengthen their relationship. • Watch D.O.G.S (Dads of Great Students) Fathers, grandfathers, step-fathers, uncles, and other father-figures who volunteer to serve at least one day a year in a variety of school activities as assigned by the school principal. BlackBoard Communication App-on-the-go access to what’s going on in the classroom, giving you the opportunity to engage, support, and enrich your child’s education experience anytime and anywhere. Opportunities for parents and community members to advance their learning are available. Please call the Family and Community Engagement Office with questions or to register at 903-356-1226 or email kathleen.witte@quinlanisd.net. 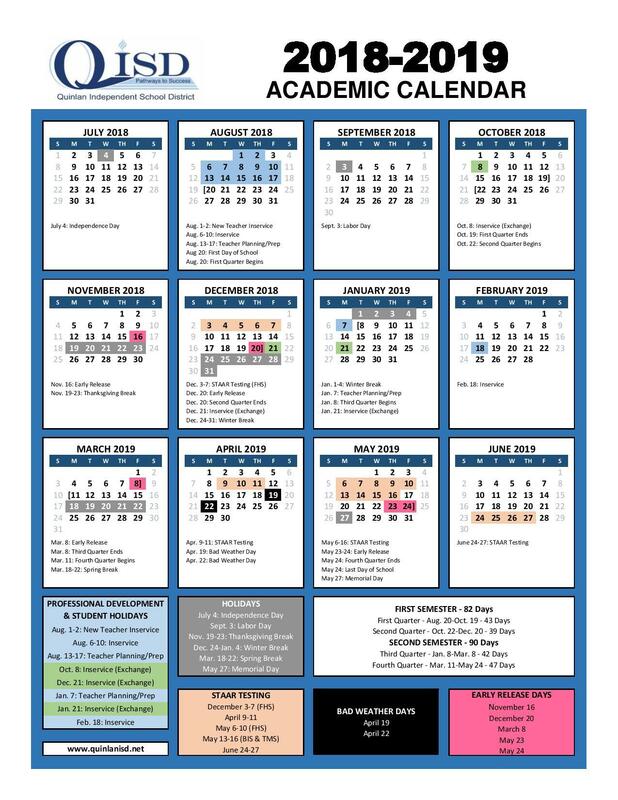 All classes are held at the QISD Community Education Center (unless otherwise noted), located at 401 Panther Path in Quinlan. Located next to Thompson Middle School and across from Grace Baptist Church. The Community Library and Museum are also located in this building. • Don’t see a class here that you would like to take? Let us know and if we have enough interest, we will try to provide that class. Want to receive text or emails with important information about Family and Community Activities and Learning Opportunities? Sign up for Remind. WHAT IS REMIND AND WHY IS IT SAFE? Remind is a free, safe, and simple messaging tool that helps us share important updates and reminders with students & parents. Subscribe by text, email or using the Remind app. All personal information is kept private. We will never see your phone number, nor will you see ours. To receive messages via text, text @qisdfc to 81010. You can opt-out of messages at anytime by replying, 'unsubscribe @qisdfc'. Trouble using 81010? 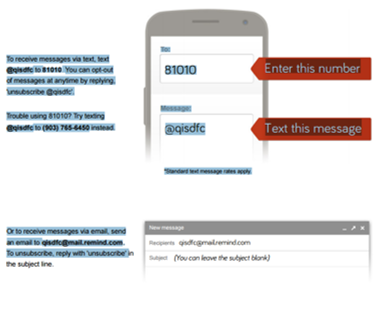 Try texting @qisdfc to (903) 765-6450 instead.